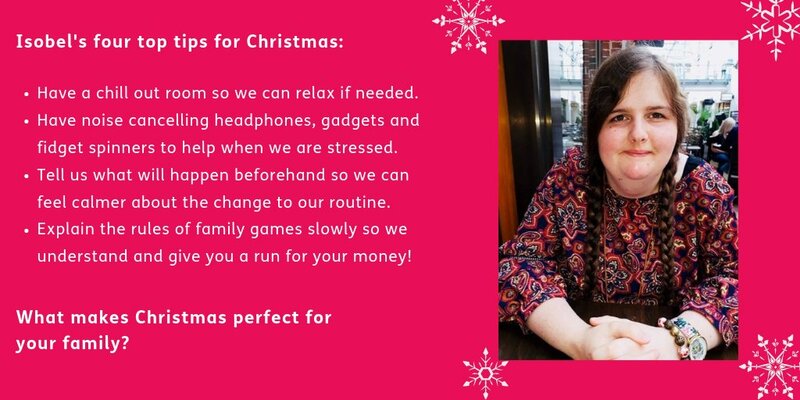 For many of us Christmas and new year can be difficult - particularly if your child, sibling or family member finds the change of routine challenging. What do you do to cope? How do you get the shopping done (food and presents) when everywhere is so busy and full of Christmas decorations and festivities? At home, do you have Christmas free zone and time? How does this work for you? If you other children how do you make time for them? Last, but not least, how do you cope? Can you get away for 5 mins? Does the rest of the family just expect you to get on with it? My main issue over Christmas is how I cope rather than how my daughter copes. I also try to be realistic. I can’t do everything. And it doesn’t have to be perfect. My son has his own jobs at Christmas. He likes making a chocolate house cake, helping me ice the Christmas Cake. He now makes the cake himself (he’s strong and 39) I have arthritis in my hands. He likes to be in charge of what decorations go where. He also takes charge of filling up the firewood basket, bringing wood up from the bottom of the garden - good exercise. Also have a quiet time planned, for jig saw puzzles, watching a favourite Christmas special. I always sort out nice food for everyone, according to my son we live on “scraps” for the days after December 25th. Cold meats, cheeses, salads, cakes, trifle, cheesecake! @vectis ooo chocolate house cake, I like the sound of that! !